Create and run your own startup scripts on your virtual machines to perform automated tasks every time your instance boots up. Startup scripts can perform many actions, such as installing software, performing updates, turning on services, and any other tasks defined in the script. You can use startup scripts to easily and programmatically customize your virtual machine instances, including on new instances at creation time. A startup script is specified through the metadata server, using startup script metadata keys. You can use the gcloud command-line tool, the API, or the Google Cloud Platform Console to provide a startup script. Note: An instance level startup script takes precedence over a project level startup script. If an instance level startup script is specified, any project level script will not be executed. The instance always executes startup scripts as root after the network is available. Copy the startup script to a local file in the instance. You could, for example, provide a Python script instead of a bash script. Keep in mind that Compute Engine will run the script verbatim, regardless of the type of script. A local startup script is a script located on your local computer. To use a local startup script, pass in a local startup script file or provide the contents of a startup script directly to the metadata server. The examples in the following subsections show how to add startup-script metadata from a local file or by direct input. Local startup scripts are subject to the metadata value length limit of 256 KB. If your startup script exceeds this limit, you will not be able to load it locally. Instead, save your file to Google Cloud Storage and specify the script URL during instance creation time. See Use a startup script stored on Cloud Storage for more information. You can only pass in a local startup script file through the gcloud command-line tool. Alternatively, you can use the console, the gcloud command-line tool, or the API to type or paste in the contents of your startup script directly. In the Automation section, supply the contents of your startup script under Startup script. With the gcloud command-line tool, specify the --metadata flag to supply the contents of your startup script, using the startup-script=[CONTENTS] key pair, where [CONTENTS] is the content of your startup script. For example, the following command creates an instance that, on startup, performs some system updates, installs Apache, and launches a single web page. You can run this command and then visit the instance's external IP address to see the contents of the index.html page. gcloud compute instances create example-instance --tags http-server --metadata startup-script="
echo \"This page was created from a simple start up script!\" ^> /var/www/html/index.html"
gcloud --% compute instances create example-instance --tags http-server --metadata startup-script="
Note: If you are running gcloud on a Windows computer, it can be tricky determining where and how to escape characters in a startup script. 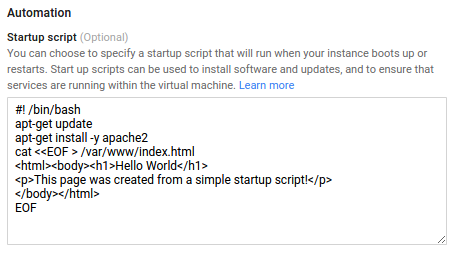 Google strongly recommends providing your startup script using a local file instead. "value": "#! /bin/bash\n\n# Installs apache and a custom homepage\napt-get update\napt-get install -y apache2\ncat <<EOF > /var/www/html/index.html\n<html><body><h1>Hello World</h1>\n<p>This page was created from a simple start up script!</p>\n</body></html>"
You can run startup scripts on Windows instances using unique Windows-specific metadata keys. Choose from any of the specialized keys listed below. Each key should match the type of script you want to run. You can also specify multiple scripts by passing in different keys to your instance. Each key can only be specified once per instance. The following keys can be used with a local startup script, using the same instructions above. You can store your script on Google Cloud Storage and provide the URL to the script when creating your instance. This allows you to access your startup script from anywhere and also bypasses the metadata server limit. Note: This section assumes that you have signed up for and are familiar with Google Cloud Storage. To learn more, read about Google Cloud Storage. In order to use a startup script from Google Cloud Storage, you must have permission to access the script. Check the access control settings on the bucket and file to ensure you have permission. By default, if you are a project owner or editor, you should be able to access files from the same project, unless there are explicit access controls that disallow it. Create a bucket. You can create a new bucket or use an existing bucket. For instructions on creating a new bucket, see Creating a bucket in the Google Cloud Platform Console or Creating a bucket in gsutil. Upload the file to the bucket. Follow the instructions to use gsutil or the GCP Console to upload an object. Give the URL to the startup script file when you create a new instance. In the Metadata section, provide startup-script-url as the metadata key. In the Value box, provide a URL to the startup script file, either in the gs://[BUCKET]/[FILE] or https://storage.googleapis.com/[BUCKET]/[FILE] format. In the Identity and API access section, select a service account that has access to read your startup script file in Cloud Storage. For example, the service account should have permissions of the Storage Object Viewer role. Using the gcloud command-line tool, create an instance with the --scopes and --metadata flags, and specify the startup-script-url key. The --scopes flag gives the virtual machine access to Google Cloud Storage to download the startup script. You can provide the Google Cloud Storage URL to the script in either gs://bucket/file or https://storage.googleapis.com/bucket/file format. Using the gcloud command-line tool, create an instance with the --scopes and --metadata flags, and specify the windows-startup-script-url key. The --scopes flag gives the virtual machine access to Google Cloud Storage to download the startup script. You can provide the Google Cloud Storage URL to the script in either gs://bucket/file or https://storage.googleapis.com/bucket/file format. If you have a running instance, add a startup script to the instance and the next time the instance restarts, the startup script will run. The startup script will also run on all subsequent reboots. Follow these instructions to set a startup script on a running instance. Click the instance for which you want to add a startup script. The instance details page displays. startup-script: Supply the startup script contents directly with this key. startup-script-url: Supply a Google Cloud Storage URL to the start script file with this key. --metadata startup-script=CONTENTS: Supply the startup script contents directly with this key. --metadata startup-script-url=URL: Supply a Google Cloud Storage URL to the start script file with this key. --metadata-from-file startup-script=FILE: Supply a locally stored start up script file. In the API, make a request to the instances().setMetadata method, providing the new metadata and a fingerprint value. startup-script: INFO Starting startup scripts. startup-script: INFO startup-script: Return code 0.
startup-script: INFO Finished running startup scripts. On Container-Optimized OS, you can also use the journalctl to view startup script output. When you run startup scripts across instances, there may be situations where you would like to use custom values in your startup script. For example, you may want to run a startup script on different instances and have each instance print out a custom message. You can specify these custom values as custom metadata key/value pairs during instance creation time and reference them in your startup scripts. For more information on creating custom metadata keys, read Set custom metadata. Specific to Linux virtual machines, Compute Engine will wait for a connection to the metadata server before attempting to get information such as a custom startup or shutdown script from the metadata server. If the metadata server is not responding or the network is not yet configured, the virtual machine will not finish booting up. Specific to Linux virtual machines with images older than v20160606, the serial port output will show "Waiting for metadata server, attempt N" where N is the number of attempts that have been made. This issue can last for up to seven minutes due to a transient network issue which should resolve on its own. If the issue does not resolve itself after seven minutes, recreate your virtual machine instance. Use the interactive serial console access to troubleshoot instances.